A Different type of Slice! Well since I’m on a roll I may as well post another project that left the shop just last week or so. 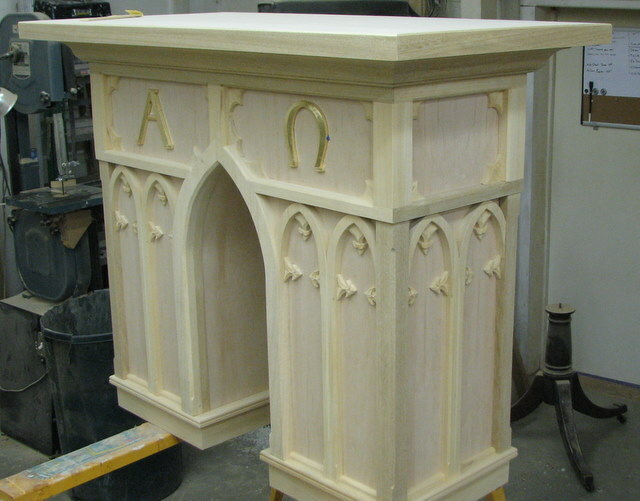 It’s an Altar and Tabernacle for the local Bishop’s private chapel. I built it out of Cherry ply with African Mahogany ( white) trim. 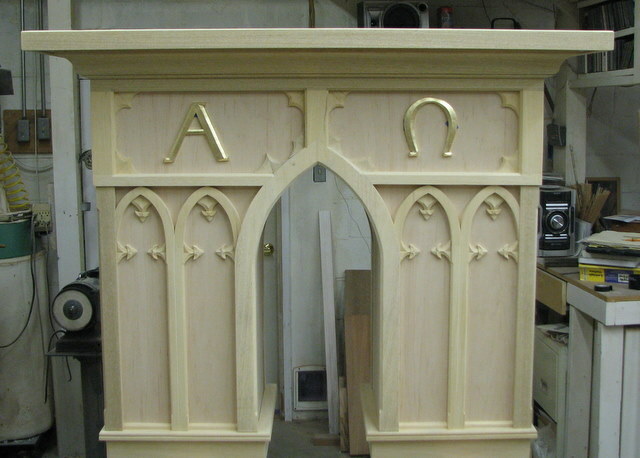 The altar is 24″ deep X 48″ wide. 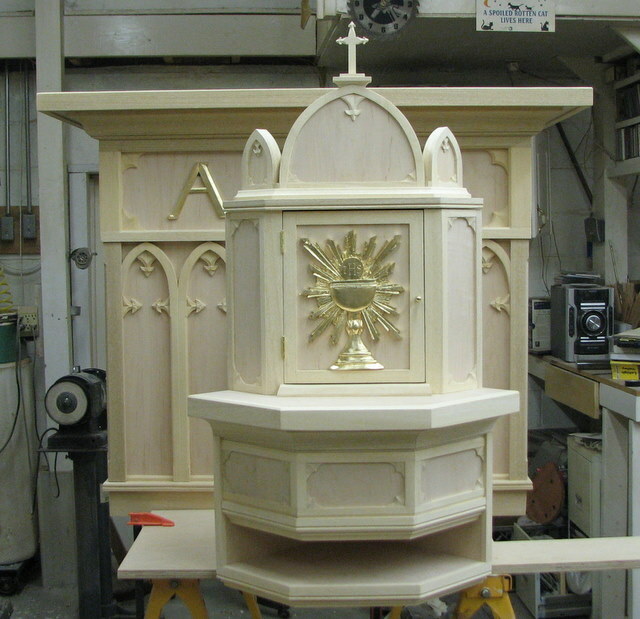 The total height of the Tabernacle is 36″ and is designed to fit into a corner to take up less room. It’s loosely based on a Gothic style of ornamentation but is my own design. He wanted something “simple” and this is the design he picked out of the five choices I gave him. So much for simple eh? Construction is pretty much straight forward. Interesting things I found to do on this though was to make the 3 inch cove moldings on my table saw. It’s not routed,, the cove is literally made on the saw,, by the saw. Neat trick! 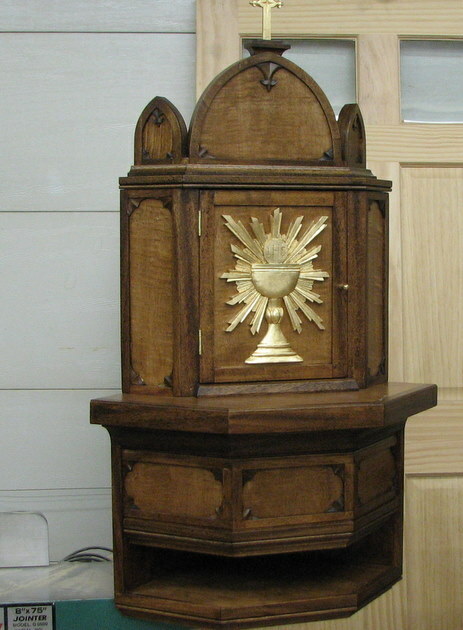 And since I couldn’t find a decent door pull for the Tabernacle that was the proper size or scale,, I made that too out of a piece of brass, turned it, threaded it and there you go. Clean and simple. The finish is your basic oil stain,,but using two different colors on top of each other followed by two coats brush on lacquer then followed with 4-5 coats sprayed on. 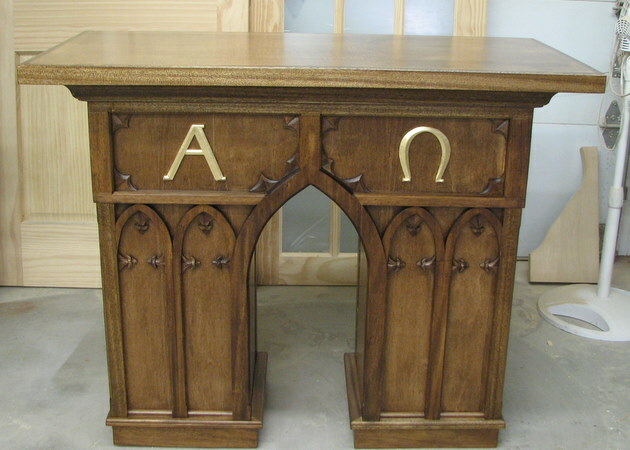 The carvings of the Alpha and the Omega as well as the carving on the door of the Tabernacle were Gilded. And the Tabernacle. The slot under the main body is for the Mass book. And here they are finished. 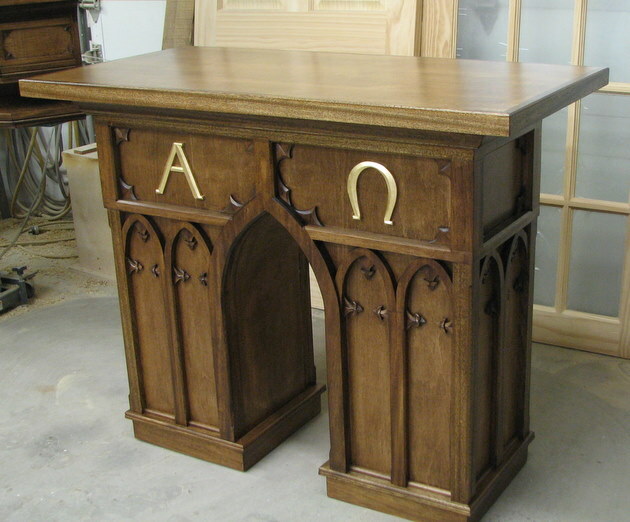 Previous Wisteria Desk Next When I’m not Carving…. markyundt on When I’m not Carving….